Abdul Khaliq Farahi son of Haji Sultan Mohammad Khan Noorzai was born in 1958 in Bala Bulak district of Farah Province. His father, a prominent figure in the country’s politics and a tribal elder served as a Senator during the royal reign. Farahi attended primary and secondary Schools in different parts of the country including Farah, Herat, Kabul and Parwan provinces. He holds a bachelors degree in Geosciences from Kabul University and graduated in 1981. Abdul Khaliq Farahi assumed the role of the Director General of Independent Directorate of Local Governance, Islamic Republic of Afghanistan in May 2011 after serving as diplomat at the Ministry of Foreign Affairs for a number of years. 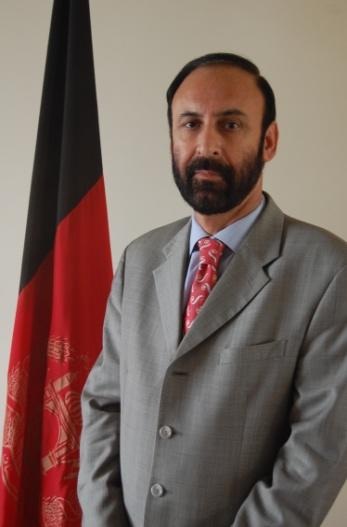 Prior to his appointment as the Director General of IDLG, Farahi served as an Ambassador of the Islamic Republic of Afghanistan to the Islamic Republic of Pakistan. Before his appointment as an Ambassador, Abdul Khaliq Farahi served as the Counsel General at the Afghan Consulate in Peshawar, Pakistan, where he rendered a constructive role by bridging the gap between Afghan refugees in Pakistan and the Pakistani authorities. During his tenure as an Afghan Counsel General, Afghan refugees in Pakistan witnessed significant improvement in their lives on a number of fronts, most noticeably in education and health. Prior to his appointment as Counsel General in Peshawar, Pakistan, Farahi devoted his full attention from 1996 to 2001 to the peace process in Afghanistan working closely with the late King, his Majesty, Mohammad Zahir Shah and his close aides. He was one of the nine members in the ‘Rome Council’. The Italian based Rome Council, also known as Rome Group tirelessly worked under King Zahir Shah for peace efforts in Afghanistan. Before the fall of Taliban, Farahi visited a number of countries including US Congress and the Pakistani authorities to build support for the convening of the Emergency Loya Jirga to bring lasting peace and stability to Afghanistan. Farahi served as a Counselor General at the Ministry of Foreign Affairs in the city of Quetta under the rule of President Burhanuddin Rabbani for about 4 years from 1992 to 1996 after the fall of Soviet Union in Afghanistan. He also served as the managing director of Farah Reconstruction Foundation, an organization to support Afghan refugees affected by the Afghan-Soviet War from 1988 – 1992. He was kidnapped in Pakistan’s north-western city of Peshawar 2008 and abducted in September 2008 in the Hayatabad Area of the northwestern city of Peshawar in Pakistan by a militant group known as Kateeba Salahuddin Ayubi. (20100503). He was released in November 2010. Later he became the Director General of the IDLG Independent Directorate of Local Governance (20110529). He is fluent in Dari, Pashto, Urdu and English.